Not only would it ban the therapy for minors, it would also require a consent form to be signed by adults subject to this harmful treatment. "Reparative therapy" is complete bunk! It is harmful to the people unfortunate enough to be subjected to it. It also DOES NOT WORK. Even "reparative therapists" have admitted this. Opponents of this bill will scream about "religious freedom" and allowing patients to decide what is best for themselves...uh, no. Religious freedom does not give one license to cause emotional harm to another individual. Patients who request this therapy are doing so because the homophobes around them have convinced them that being gay is bad. 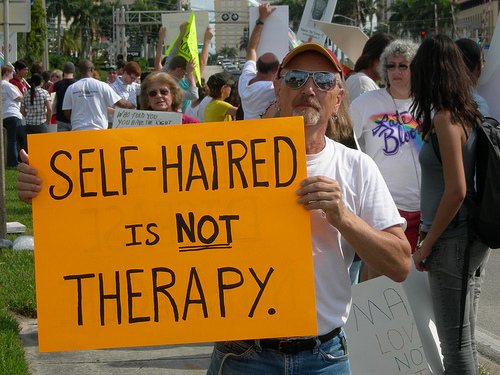 "Reparative therapy" is the symptom of a disease called homophobia. This bill goes a long way to curing this disease. Having a lesbian, gay, or bisexual sexual orientation is not a mental disorder. There is no scientific evidence that any types of therapies are effective in changing a person’s sexual orientation. Sexual orientation change efforts can be harmful. The risks include, but are not limited to, depression, anxiety, and self-destructive behavior. Medical and mental health associations that oppose the use of sexual orientation change efforts include the American Medical Association, the American Psychological Association, the American Psychiatric Association, the National Association of Social Workers, the American Counseling Association, the American Academy of Pediatrics, and the American Association for Marriage and Family Therapy.